When I was 5 years old I found a chess set in my dad’s parent’s house and had my uncle teach me to play. I was immediately brought into the grandeur of two royal families battling across distant lands for unimaginable riches and prestige. Bobby Fischer became my hero and I read as much about chess for the next few years as I could. My dad would cut out the weekly chess puzzle from the Philadelphia Inquirer and I would pour over them until I figured it out, and I remember the day I first read about Blitzkrieg and spent an hour teaching my mother how to play chess just so I could move my cheap plastic pieces four times and checkmate her King. I felt like a king! I could do something my parents couldn’t and it took me to a world inside my imagination that I could live out on a small board with 32 pieces on 64 magical squares. When I was 8 years old my grand parents came back from a vacation in Puerto Rico with a gift for me. My second chess set – probably for my parents, but I thought it was mine. It was alll marble including the board. So heavy, I dented the table with it when I accidentally dropped one of the pieces. In addition to giving ‘my chess’ validity, it also opened me to life outside my imagination and my home. There were people all over the world too! Like, ACTUAL people. That’s a big step in a child’s development and maybe my first desires to see the world. Add a few kids and a chance to teach them my lost love of chess, I got my middle son hooked and he soon gave me a run for my abilities. Now we live in Europe and enjoy traveling here quite a bit. We’ve also started our ‘modern gaming’ collection and our focus for games has moved into a passion (obsession) that often doesn’t have room for those ‘simple games’ like chess, but my midson’s love of it and my interest in cultures keeps us buying more sets and still playing whenever we feel the mood. We bought a beautiful set in Budapest and most recently last week the family was in Istanbul’s Grand Bizarre where he found a fantastic set that then found its way onto our sailboat tour of the Greek Islands. Other than in my youth, pouring over the back pages of Boy’s Life and drooling over the chance to buy a Star Trek 3D chess board, this is one of the only games since I’ve never wanted to change or buy an expansion for or modify any other way then just buying a culturally relevant hand made set that pitted armies against armies or fantasy against fantasy. But our sets are a hard game to travel with. We like full sized boards and the Istanbul set just barely fit inside a suitcase and dirty laundry and to be shifted around to backpacks and other suitcases. But I digress, this is actually a review of Catalyst Game’s 2013, The Duke!! I’ll be straight with you here (finally): it is a wonderful game but lacks the history, passion, spectacle, grandeur and even (sorry) the strategy of Chess. 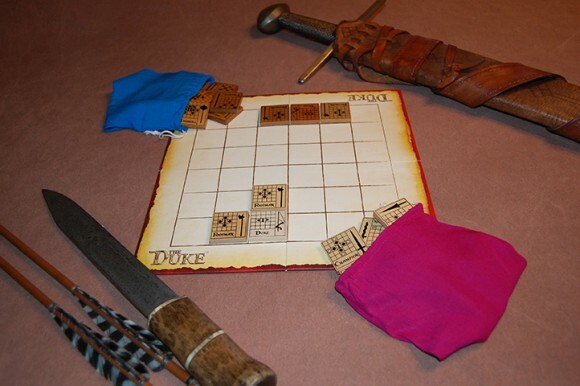 If you are coming to this review and the game as I did thinking it might be a replacement for chess but don’t know much more about The Duke, think of it like chess where every other move your pawn changes to a knight and your queen, after she moves, is now a bishop and if you like that idea you might really kinda enjoy this game too. Thankfully though, The Duke is actually much, much more than that. The pieces are tiles that have movement on each side and after each move that tile is then flipped to its other side. But more than just changing a piece’s movement, it adds theme. The Footman, standing guard next to your important Duke can move one square – not leaving the side of the man he is charged to protect, but that then it rallies his muster and jumps forward to lash out with his axe in immediate defense as needed. His next turn he must return to his guard responsibilities and relax after that battle. A Marshall can lunge into battle right away and then his next turn command troops in front of him. The Wizard (wait… A WIZARD?) can move any direction and then magically appear somewhere else. A General can lead from the front commanding his troops behind. All this makes for a fantastic game full of strategy and theme… I think. I don’t know… If you don’t mind having wizards pop up in the middle of your feudal wars; if you don’t mind, that in the heat of battle when your Duke is in the middle of the field surrounded by enemy pikemen, magically a General appears next to him and saves the day; or that there is a sense of randomness to the play as you only start with three tiles and then must deal with what is next pulled from a bag — kinda like drunk soldiers finally returning from a night at the pub, late to the fight — then this might be the best chess replacement there ever was! We are still going to play Chess, people all over the world are still going to be playing Chess and artisans will continue to be inspired to create collectable components for a game that will out live us all – but I am glad that we found The Duke, it will go into my travel bag as a permanent addition. And, as I continue to travel the world, I will also be looking for that marble 6×6 grid and marble tiles etched with the dots, stars and pawns of The Duke to give MY grandchildren one day. Add a Review for "The Duke"